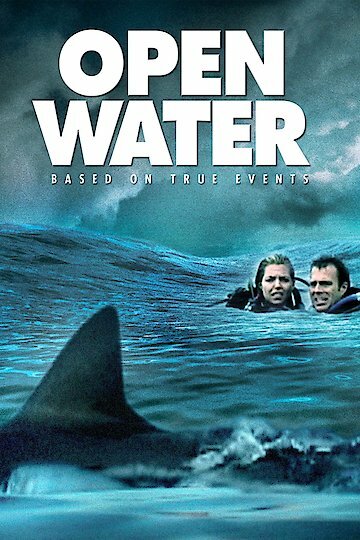 Open Water is a 2003 movie based on the true story of a young couple, Susan and Daniel, who are inadvertently left in the water while on a scuba diving trip. As they drift slightly away from the rest of the group while diving, they return to the surface only to discover that the tour boat has left and they are stranded in the middle of the ocean. They are not discovered missing by the crew until the next day, due to an error in the required counting of passengers. The majority of the movie centers around what happens to them as they drift further and further out to sea, plagued by dehydration, hunger, jellyfish stings and the constant threat of sharks. Initially they expect to see the tour boat return for them. However, it is not until the next day when someone notices that their personal belongings are still on the boat, and the hotel manager reports that they did not return to their room, that it becomes clear that they are still in the water and a search gets underway. Open Water is currently available to watch and stream, download, buy on demand at Starz, Amazon, Vudu, Google Play, FandangoNow, iTunes, YouTube VOD online.